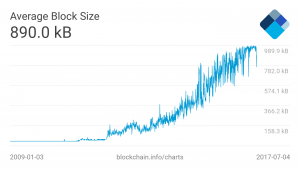 The scaling is needed desperately, because the blocks of the bitcoin blockchain reach the 1MB limit (see chart 1). Why? Because one single transaction has an average size of 400 – 500 bytes and nearly every 10 minutes a new block is found by the network. Therefore, 3-4 transactions / sec can be processed at a max, with 1 MB blocksize. (As compared to VISA with 56.000 transactions /sec at a max.) The more bitcoin users the more transactions reach the network and therefore to get a single transaction processed takes longer or the user pays a higher fee to get his transaction picked by a miner. This problem is known since the early days of Bitcoin and solutions are discussed since 2015. Now that the blocks are actually full a scaling solution has to happen, otherwise people won’t use Bitcoin anymore (because of the high fees) and the miners will loose their business model. There are a couple of scaling solutions on the table, but problem is: You need the majority of the network hashing power to agree on a scaling solution to actually change the protocol and implement a scaling solution. The two main opposing parties are ‘Bitcoin Core’ and ‘Bitcoin Unlimited’. Core wants to implement a second layer called SegWit which segregates the witness, i.e., the signatures of the transactions are off-chain. This would make more transactions fit into one block. Unlimited on the other hand wants bigger blocks which would fit more transactions into one block as well, but without the technical complexity of SegWit. A distribution of the respective blocks (see chart 2) shows that Core has around 60% and Emergent Consensus around 40% of the hash power. SegWit2x originated from an Agreement signed in New York in May 2017. The Future of Bitcoin Conference was visited mainly by the emergent consensus fraction of Bitcoin, although Core people where invited. 100% Bitcoin: Lot of Bitcoin maximalists were at the conference, which see Bitcoin as the one and only cryptocurrency. They don’t want Altcoins, they want coopetition on Bitcoin. We need to scale now: Scaling on-chain and off-chain is needed immediately. SegWit ain’t scale: SegWit is not Bitcoin and it is not a good scaling solution. They see bigger blocks as the only right solution to go forward. Ethereum is just about ICO Scams: Most of the contracts running on Ethereum are there for ICOs. And ICOs are seen as scams. Bitcoin might be turing complete: Ryan X. Charles and Craig Wright announced independently a paper to prove, that Bitcoin script is turing complete. Hard fork is coming: People are not afraid of a hard fork anymore. 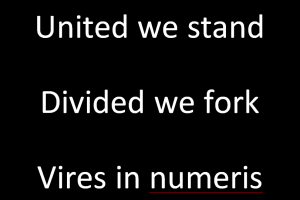 The fork might not be SegWit2x. A further detailed summary of the conference can be found at bitsonline.